Writing is a tough, demanding and lonely craft. You’ve got to think of an idea, figure out if it’s worth writing about and then get the words down on the blank page in a room, by yourself. Even when you’ve got this part of the creative process under control, it’s still your job to turn up and write every day, to publish your work and to find an audience. The journey of every writer is marked by creative, personal and business challenges just like these. 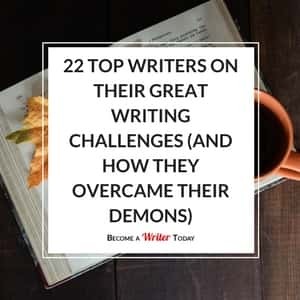 I wanted to find out more about these types of challenges and how today’s professional and successful writers overcame them. What was your greatest writing or creative challenge and how did you overcome it? I’d say the biggest writing challenge I’ve faced was actually the book I just finished. It was a sequel to a very successful first book. I went into the project thinking I knew exactly how it would go, but every time I tried, it didn’t feel right. I banged my head against that book for a year trying to hammer it into place, but it was never right, because (as I finally discovered) I was trying to make it into something it would never be. It took me an embarrassingly long time to admit I was the problem, but in the end, the only way forward was to swallow my ego, cut myself free, and start over with an entirely new idea. This is a terrifying thing to do when you’re already months behind. Plus, I’d already written and trashed over two complete novels worth of writing. That’s enough failure to make anyone hate their book. If I gave up, though, I’d be abandoning my fans and a series I really did love before months of dead ends soured me on the whole thing. Starting over and pushing through that project was the most difficult and humbling experience I’ve ever had as a writer, but I made it, and even better, I made it with a novel I’m very proud of. I think when I look back on my career, I’ll consider refusing to give up on this book or to publish something I couldn’t be proud of as one of the watersheds of my progress as a writer. Awful and humiliating as the failures were, pushing through them forced me to grow as a writer and as a professional in a way the successes never could. I wouldn’t wish a hell book experience like this on anyone, but I think I came out stronger for it, and for that alone, I’m grateful. My biggest writing challenge is the same today as it was for the first piece I wrote when I worked at The New York Times, the same it was for all four of my books, and for every radio essay, magazine piece or op-ed: Making that extra phone call. Stopping one call, fact-check, or piece of reporting short of what is needed is a hallmark of a lazy writer. But it’s also the hallmark of a busy life, and we cannot let one influence the other, since while being busy is a cultural reality, it is no excuse for turning in a piece that is anything but as good as it can be. These days, I write a great deal of memoir, a genre that has an unimaginable (to me) and wholly inaccurate reputation for being easy. I solved this problem years ago by simply moving the landline phone next to the computer. This is where many writers keep their lucky pencils, worry beads, or photos of a dream house in Tuscany. For me, that clunky old phone is an amulet as well as a nag, and it serves me every day as I move into that lovely end zone of a piece, when I make the mistake of thinking I’ve got it nailed and then remember that maybe, just maybe, I don’t. The biggest writing challenge I’ve faced is myself. I got in my own way for YEARS!! Making excuses, placing blame, ignoring my writing dream, letting fear get the best of me. I’ll never forget the day I finally started to take my dream of writing a novel seriously. It was a Saturday, and I had the whole day available for writing. But I kept coming up with things I needed to do first, things that were “so much more important” than writing my novel. And then I found myself with a clean apartment, no dishes in the sink, washed laundry and nothing to do but write. In that moment I knew I had to decide if writing a novel and being a successful writer was truly important to me. I decided that it was, so I began to drop the excuses, flip around the fears and commit to taking action on my writing every day. I didn’t write every day at first, but I did work on something writing related (story planning, character development, etc). It took time to get rolling, but 7 years later I’m finally about to publish my debut novel, and I’ve made a career out of being a writer. Amazing things can happen when you get out of your own way. There is a necessary dichotomy in every writer’s brain: we need a certain level of self-belief to put our work out into the world, but also a healthy dose of self-criticism to ensure its quality. Dealing with this is the biggest writing challenge I’ve faced. And it’s one I still face, every single time I sit down to write. The solution (like the problem) is in your own head. You don’t need that critical voice when writing the first draft. In fact, you should ignore it, because it can make you freeze up completely. If you start being critical about your opening page, you’ll never finish that first chapter, let alone the book. You need to vomit up the words until you hit The End. Then you can be critical. Everything can be fixed in the second draft… except for a blank page. So switch off that critical voice. Give yourself the freedom to get the bones of your story down on the first pass. You can worry about putting flesh on those bones later. Because once you have that first draft done, nothing can stop you. The greatest challenge I have had to overcome as an author is the realisation that the financial return will never equal the investment in time, effort, energy, heart, and soul that goes into creating a book. Simply put, books are a terrible business to be in. The way I’ve come to terms with that sad fact is by acknowledging that I’m not a writer because it is a smart business decision. I’m am a writer because I can’t not be a writer. My greatest writing challenge was confidence. Early in my career, I was afraid to call myself a writer because I was transitioning from a career I hated to my passion. To overcome this challenge, I wrote consistently and started to BELIEVE that I was truly a writer. The second case of lack of confidence I experienced was my fear of writing about controversial issues, such as race in America and the media’s negative portrayal of black people, that are near and dear to my heart. I’m still sometimes challenged with this, but when I have to speak up, I’m unstoppable. My final and worse case of lack of confidence occurred when it was time to charge for services. It took years to get over this. Now, I let people know the value of the services I provide and charge accordingly. There are so many challenges to writing and I think the first thing most of us will think of is handling all the rejections. However, for me it was simply finding the time to write when my all three of my kids played travel hockey and we averaged 170 games a season in two countries and three states. My first couple of books I wrote at the ice rink between practices and games. It’s difficult to pick out one “greatest” challenge when it comes to writing, especially if you write for a living as I do. Writing for a living presents an ongoing series of challenges. There are hundreds, thousands of articles and books about writing that address various challenges. Things like getting through writer’s block or finding an agent/publisher or plotting or characterisation. All of that is useful up to a point but always you are faced with the fundamental challenge of being a writer. To put it simply, it’s the will to create and believe in your ability to create something of interest. Standing in the way is the hard reality that writing is difficult work. No one tells you what to write. You have to make it up as you go along, out of nothing. You have to allow your imagination to step out and take control. You have to get it down, one word, sentence, paragraph, chapter at a time. That brings you face to face with what I consider to be the greatest challenge and I face it with every book. Sometimes it is and I end up throwing out days of work. The biggest challenge for me is to know it’s not the end of the world and that sooner or later my muse will return with a better result. Believing that is the key to meeting the challenge. My biggest challenge came at the very beginning of my writing journey. I knew I wanted to write, but had been told for years that you either “have it or you don’t” and that you can’t learn to be a great writer. I didn’t think I had it, but when I determined I had to try, I went out and started studying and . I kept writing and applying what I was learning, and then one day I had an actual epiphany. Lightbulbs started flashing. It was realising that scenes should have an objective, obstacles, and an outcome that is usually a major setback. From that point on my plotting was strong. I started to sell. And got the confidence I needed to go on. One of the things I’ve been wrestling with over the last couple of months is, what is my identity? Am I a fiction writer? Or am I a nonfiction writer? Or am I both? My website right this minute is a bit of a hybrid. I’m actually working on that behind the scenes, so I’m going to make sure that my main website that you see from all of the stuff to do with and my fiction work is just about that, and I’m probably going to set up a second website for the because the audience there is other authors. The way I often explain this new publishing approach to non-writers is with a restaurant analogy. In the past a publisher might have been happy flipping burgers and selling to the masses. Now everyone is able to open a burger joint. Publishers now need to be different, better… they are no longer looking for grill cooks, they are looking for Michelin star chefs. This is a golden age for writers and the impact of Amazon self-publishing platform will continue to echo over the coming years. But one thing that has already changed is what it means to be a ‘writer’. Gone are the days of a writer’s only path to success being through the slush pile. If a writer now wishes to side-step the gatekeeper and go it alone, it is a very viable option. So, what’s the ‘the biggest challenge facing a writer’? For me, is it the challenge of a writer deciding what type of writer they wish to become. There’s no harm is being a grill cook, writers can make good money and have the freedom to plot their own publishing journey, but is that what a writer really wants? Or are they seeking something different, do they need the prestige that comes with being ‘picked by a publisher’? Are they looking to become that Michelin star chef with all the highs and lows it brings? Or is the writer looking for something different and new? Technology and the internet are allowing writers to constantly reinvent what it really means to be a ‘writer’. Only by making and embracing the choice that faces them will writers have a shot at success. Being published. No, seriously! Being published and read by others is amazing in countless ways. It has made my life and my writing richer. But it also makes writing harder. Once you realise you’re no longer writing just for yourself, but that every word you write is being read (and judged—for better or worse) by others, it’s hard to keep that thought out of your head while writing. The pressure is on, and it can be crippling. I went through a sophomore-novel stage where I found myself over-thinking my first drafts to a ridiculous extent. My writing suffered, and I stopped having fun. As much as I love and appreciate my readers, I remind myself every day that I write, first and foremost, for myself. I write because I love it—because I have stories bubbling up out of me. I focus on that and not on what readers may or may not want, and my writing is always the better for it. My biggest writing challenge is navigating the demands of self-published market as it changes year-by-year. I overcome each day by learning from close friends, networking with marketing experts, and pushing forward to continue writing the books I’ve always loved to read. My biggest challenges are always creative – how to do justice to an idea. I’ll start with an exciting idea – for instance, what if I turn the classic reincarnation story on its head? Instead of sending a character to examine her past life, what if she suspected she had a future life and somebody was receiving her as the past? That’s how was born. These ideas arrive full of freight – although, like dreams, they keep it locked away. My writing process is part research and part search; a labyrinthine route of interpretation and guesswork to discover what it means. I write reams of notes; long, secret essays I may never read again. The chances are, I’ll find them absurd, wrong or naive. But as I keep visiting the book and sharing my thoughts with the page, I begin to understand what my gut is telling me. My Memories of a Future Life became an exploration of despair – a person who had lost faith and hope in her own life. The challenge is always to release the potential in an idea. It’s tough, but once it’s done, it’s so rewarding. Choosing which story idea to pursue. I finally just went with the idea that fascinated me the most–without worrying about how big the audience was for the story. I think you have to be passionate about your story first–it comes through in your writing and that’s what readers love. Plotting has always been my biggest writing challenge, but, alas, it is one I have yet to overcome. My writing style is fairly unadorned and cinematic. I want readers to always be thinking, “this passage is so engrossing, I have to know what happens next!” In order to accomplish this, I take great pains to deliver intelligent, tight plots with complex mysteries at their centers and plenty of twists and turns. Before I begin each new novel, I probably spend a month just trying to figure out the overarching direction I’d like it to take. But even if I think I have a reasonable idea of the actual plot, I’m only fooling myself, because no plot survives engagement with the page. For me, writing a novel is like putting together a 5,000-piece jigsaw puzzle. Until you’ve laid some of the early pieces, you don’t have any idea what you have to work with, so you can’t possibly know where later pieces might fit in. This is very scary for me, because I’m never able to figure out the endings of my novels until I’m at least halfway through them, and most times I’m convinced that doing so is impossible—until I finally have a eureka moment (after I’ve pulled out handfuls of hair and my stress levels have climbed into the stratosphere). Too often writers spend all their time worrying about marketing themselves. If they would just pay attention to the work, if they put their energy into turning themselves into the best possible writer they can be…to do that, they have to cultivate taste. The difference between an amateur and a professional is that amateur writers love everything they write, they keep every scrap and every page thinking that some day somebody is going to want to do a PhD thesis on them or whatever delusion they live in. They know they have to destroy it all in order to get to that precious few moments of real creativity when they are writing at their best. (Professional writers) hate everything they do because they have high standards. What I see so often in my work is that people have no standards. Or, their standard is what was just published last year, or what was just produced last year. They want to copy that with a slight variation. They want to write the way they think they’re supposed to because they have no real standards. So don’t worry about marketing. If you write really well the first person you show it to will become your champion. The biggest challenge in writing for me is always getting started. It can take hours or in some cases even days to decide on a topic I want to write about. Once I decided that everything else falls in place. I start researching the facts, collect contributions and links and it’s like a puzzle that shows a beautiful image in the end. If I am REALLY not in creative mode I sometimes do a filler post consisting of quotes or images only. This buys me some time before the next epic piece must be written. The way I try to overcome this is by writing articles in clusters. That means after finding the topic I will write a blog post, guest posts and maybe even start an ebook about the same thing. This helps a lot to be more productive. Finding ideas is mainly a process of reading industry blogs, do random Google searches or play around with ubersuggest.org to find fresh content. Talking to other people and interacting in the comment section of any given website or on Twitter also can help. I’m sure you’ve heard this time and again, but social media is the biggest challenge I face as an indie author. There are countless opportunities for an author to interact with readers and other writers online. Too many, in my opinion. As an introvert, I find the process overwhelming and way too time-consuming when all I really want to do is write novels. When I found myself close to a mental breakdown last month over all the responsibilities of launching my latest novel, I had a little heart-to-heart with myself and decided I would restrict my hangout sessions to the networks where I feel at home. Isn’t that the way we choose to socialize in person? I’m concentrating on Facebook, which is where most women my age hang out, and on Goodreads for the same reason. I also recently joined the Women’s Fiction Writers’ Association as that seems like my kind of cocktail party—low key, girl to girl talk about women’s fiction. Mostly, I’m trying to approach social media as fun instead of work, which is helping enormously. Finding readers for my work. The way to solve it – hard work, invention and a willingness to learn. Mailing lists are critical, and then finding readers to fill them. When you have that sorted, graduate some readers to a street team and work together to solve the visibility problem with early reviews and buys. And, over all of it, treat customers as readers and be flattered when they get in touch. Answer every email personally and those readers become fans and, sometimes, friends. I spent seven long years not selling and rewriting and polishing and writing slow and following every other myth I had ever been taught about writing. I was just about to give up when I started reading how real writers did it, and then I found . I decided to follow those business rules without missing. I started selling almost at once and have never looked back and never stopped following those five business rules. But I really regret those seven long years of following the myths of writing. I have faced two very big challenges. The first is being successful as an independent author and independent publisher. Mainly because it’s okay for you to self-publish a book, but its not okay for you to make a lot of money from it. So, if you can publish the book and become a self made millionaire, that’s called being ‘divergent’ and if you are me, that is a problem, so much that I was denied the right to do business and I wasn’t allowed shelf space, and was threatened with imprisonment all because I was selling thousands and thousands of books every month. It got so ugly, folks were not allowed to buy or even order my books from certain bookstores. Then, the other challenge for me is that I am black and as a black writer with NY Times Best Selling novels, I haven’t been given, and in some cases, not allowed the same opportunities in the market place as white authors with books of less selling potential. And forget about your NY Times best selling novel being turned into a major motion picture or television series if your African American, your readers are NOT going to see their favourite characters to come to life, because that’s totally not going to happen either. It’s sad, but the marketing dollars just aren’t given to African Americans and they never have been. So, these issues have presented themselves to be extremely challenging for me as an African American writer and as the owner of an independent publishing company. However, these challenges do not prevent me from dreaming, from believing in myself, from believing in my work, and these challenges will never stop me from reaching folks that are willing to support me and read my books. Professional writers don’t quit when things get hard. Even when they’d rather do anything but write, professionals concentrate on improving their craft, on getting the words down and on shipping their work. They do it because it’s their job. You can use any of the solutions put forward in this post to overcome some of the challenges you’re encountering on the blank page. For this post I interviewed mostly fiction writers. Prefer to learn more about non-fiction writing? Need help getting started writing? Use these proven writing prompts. I’ll also send you practical writing advice and more as part of my newsletter.